Important developments are taking place in the lithium ion battery sector. For years we highlighted lithium as the new gasoline. I highlighted in this article entitled “Lithium-Ion Batteries becoming the fuel of the future” written over two years ago that demand could soar for electric vehicles. See the article on Seeking Alpha from more than two years ago. Now two years later even the big player investment banks like Goldman Sachs are finally entering the sector. Listen to Bob Koort, head of Industrials and Materials research for Goldman Sachs Research, explains how lithium could unlock the mass market potential of electric vehicles. It would not be a surprise to our readers if institutions are looking to add Lithium Americas as it is the most advanced lithium junior with the highest quality asset. They are partnered with the lowest cost producer SQM in Argentina and trading on the North American exchanges. This could become an institutional favorite. Attention should be paid to a news item which may be finally gaining notice. Lithium Americas (LAC.TO or LACDF) appointed former Tesla Senior Engineer Dr. David Deak as Chief Technical Officer. According to his Linkedin profile Dr. Deak managed significant projects at Tesla including processing raw materials from Mine to Gigafactory. 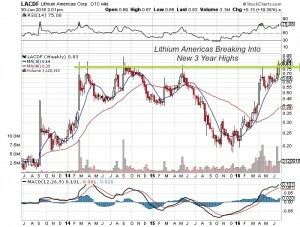 This appointment is a huge boost of confidence for Lithium Americas and may start getting attention from the Battery Investment Community. Big news was released today by Graphite One (GPH.V or GPHOF) of performance tests on coin cells manufactured from the spheroidal graphite that shows high performance and stability. Graphite One is developing the Graphite Creek Project in Alaska which is the largest known large flake graphite deposit in the USA. The Company’s PEA is expected to be completed in Q3 2016. Today’s news may draw attention from the battery manufacturers who are looking to improve power output and efficiency. “Up to this point, EV battery end-users have had to make a choice between systems that deliver high-power (near 100 kW) and high-energy (tens of kW hours between each charge). Finally I would like to revisit Nano One Materials (NNO.V) which may also be bouncing off the 50 day moving average as the investment community begins to see the unique qualities of this company. Earlier this month they reported that the design phase of the lithium battery material pilot plant has been completed. 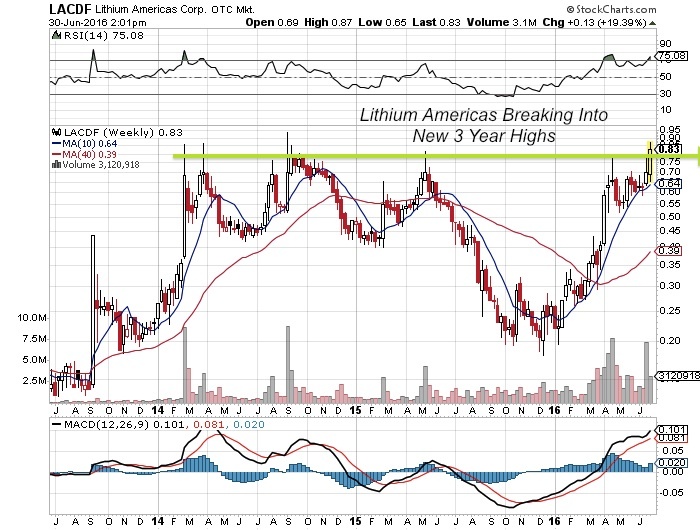 Disclosure: I own securities in Lithium Americas, Graphite One and Nano One. They are also website sponsors. Owning securities and receiving compensation is a conflict of interest as I could personally benefit from a price/volume increase. Please do your own due diligence as this is not financial advice! I am biased towards my sponsors (Featured Companies) and get paid in either cash or securities for an advertising sponsorship. I own shares in all sponsored companies.